Sounds like the name of a band. If anyone uses it I think I should get royalties. I mostly listen to the local NPR station ( staffed primarily by volunteer programmers). There are several different types of programs, some music, and a few talk. Not too much national stuff — the budget is very small. It seems like once a week or so I hear “we have a report of a lost lab – answers to the name of Trudy”. And if you listen long enough, you hear that Trudy made it home. It’s nice. There is the Ship Report on weekday mornings, which gives a breakdown of the comings and goings of all the big boats that make their stops along the Columbia River. It is a remarkably busy shipping channel. We have weather here. Real weather. Seven feet of rain, on average. Often I look out and the sea is a a mess. During the storms, the swells grow to 20 feet, easy. Though the past few weeks has been unusually calm, dry, and cool. The air is incredibly clear. I see a million stars at night, and occasionally even a satellite while I lie in bed in the pre-dawn hours of the morning. And then there is the big river. The bridge over to Astoria is four miles across, and I never tire of the view when crossing. Last week it was so calm, it was masquerading as Lake Powell, smooth as glass, which is a rare sight this time of year. Water skiing, anyone? Yeah, I’ve never seen it around here. That water is cold. 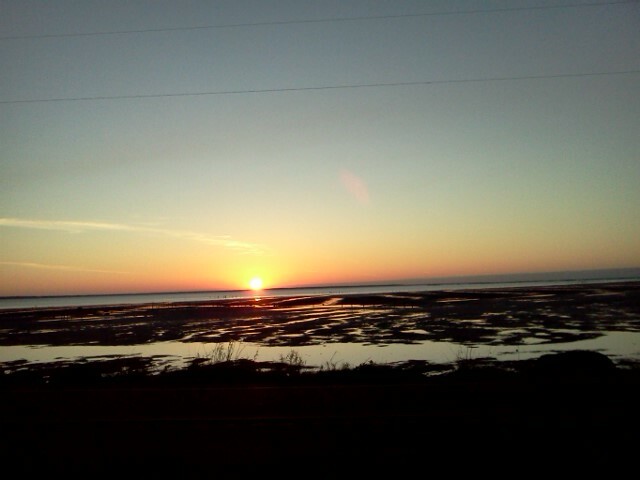 And the sunsets here are stunning. I took this shot looking out toward the ocean near the mouth of the river. This time of year is special. On Monday morning I looked out to see the telltale twinkle of lights on the water, signaling the onset of Dungeness crab season. “I’m dreaming of a crabby Christmas…” . I got up and counted an even twenty boats making their way north along the peninsula, setting their pots for a couple days of soaking. It was clear, cold and the sea was calm; no doubt there were a lot of happy fishermen. The locals here relish the winter (but truth be told, the talk turns to warmer climes in a wishful sort of way). Few tourists, no lines at the grocery stores, and no one on the beach to speak of. Excepting the clam digging weekends, when it gets busy for a couple of days. 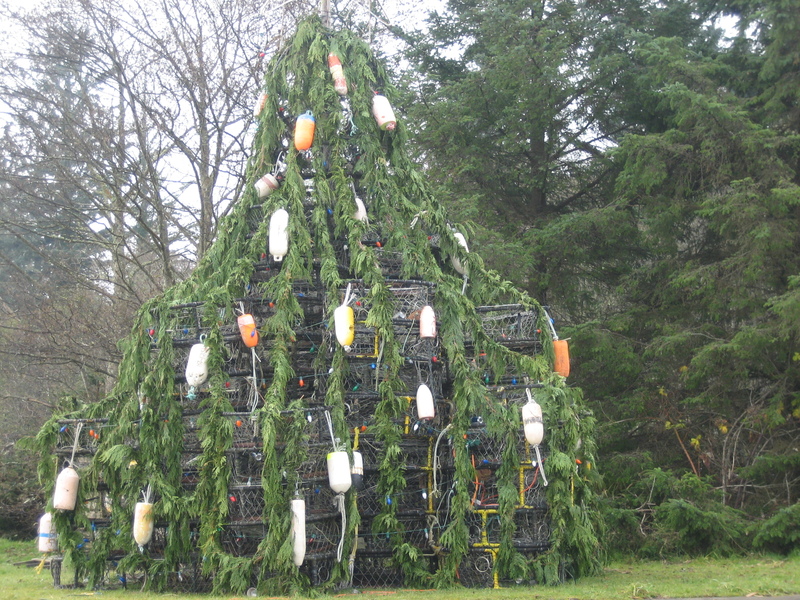 And winter here brings the annual crab pot christmas tree to the port of Ilwaco. A night shot would be better, but my camera has it’s limitations. And with it nearly Christmas, I have soooo much sewing to do. The past few weeks have disappeared too quickly, and once again I feel like I lost a week or four. There were a couple of trunk shows at the coffee shop, and lots of work leading up to them. I hope to get one day to cram a ton of baking in before we leave on Friday. And just maybe a ‘regular’ sort of post here. Some good news, sewing project / progress, or the like. And with that, I head for the studio. When I drove to New Mexico last year, I came across a couple of radio stations doing a show called “tradio” where people would call in and say what they had for sale or trade, I enjoyed it. We need to have our own fabric, quilting & sewing show on Coast Comm. Radio – I can hear it now. We’d be like NPR ladies on SNL, but instead of Schweddy Balls we can talk about fat quarters and stray threads. And of course we’d be totally cool.